I know it is spring and pumpkin is a fall produce item. In my opinion, pumpkin can be eaten anytime of the year and also be good. Hey, that's just me! For the pumpkin lover, this sweet treat uses canned pumpkin, cream cheese, vanilla pudding, and spice cake mix. PREPARE cake batter as directed on package. Add dry pudding mix and pumpkin; beat 2 min. Spoon into 24 paper-lined muffin cups. BEAT cream cheese in medium bowl with mixer until creamy. Add sugar; mix well. Blend in egg. Spoon over batter in muffin cups. BAKE 18 to 21 min. or until toothpick inserted in centers comes out clean. Cool in pans 5 min. Remove to wire racks; cool completely. SPOON frosting into medium bowl. Add COOL WHIP; whisk until blended. 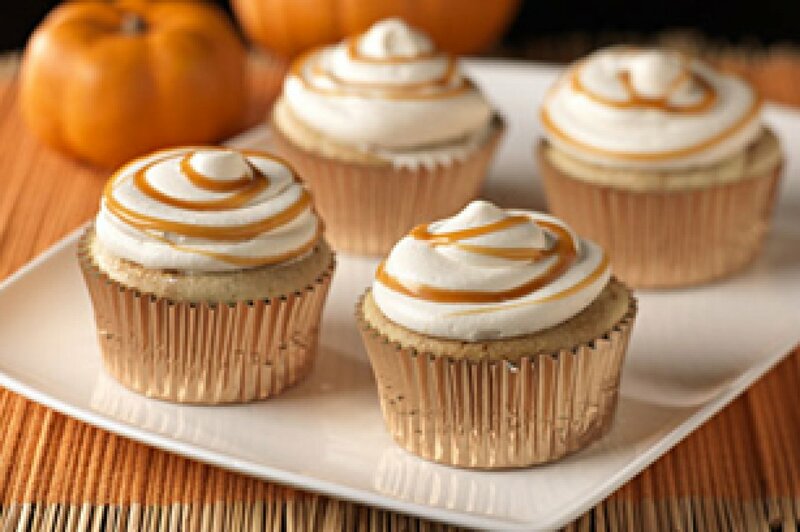 Spread onto cupcakes; drizzle with caramel topping.